In order for a digital simulation to provide an artificial teaching environment there needs to be a computational model of the act of teaching interacting with software agents. The COVE model integrates Cognitive science models, the OCEAN model of psychology and OCC model of emotions, Visual-Auditory- Kinesthetic perception and the Environment (social and physical expectations) for learning. A context for the COVE agent model is provided by the How People Learn (HPL) theory of learning and Behaviorist-Cognitivist-Constructivist (BCC) instructional framework. This chapter presents design considerations for computationally modeling COVE to enable agents to possess the psychological, physical, cognitive, and social aspects of learning that enable the representation of behaviors of students in learning environments and to allow simulation of HPL-BCC theories of instruction and learning. 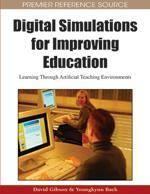 A groundswell of research and interest indicates a wide range of benefits of educative games and simulations. The research addresses why we should build educative games, and what options and frameworks are available for building them with a technical and artistic balance of pedagogy, simulation and game elements. Among the benefits are practice-based development of procedural knowledge, motivational self-directed experiences, inquiry-based trial-and-error learning with immediate feedback on progress, and tangible results (Prensky 2002; Beck and Wade 2004; Gee 2004; Squire 2005). Social theorists add that learning in simulated environments engages participants in new forms of identity, social negotiation, and virtual economies while promoting and practicing skills needed for a knowledge-based, globally-networked society (Galarneau and Zibit 2006; Jones and Bronack 2006). Technical and theoretical entrepreneurs furthermore envision a radical transformation of e-learning from text-based to epistemic experience-based learning with vastly increased value to participants due to automated analysis, personalized feedback, and adaptive artificial intelligence (Aldrich 2005; Becker 2006; Gibson 2006; Stevens 2006; Van Eck 2006; Shaffer 2007). These developments suggest ways that teachers can benefit and education can be improved through games and simulations, including artificial teaching environments. The plan of the chapter begins by outlining a cognitive science framework of learning and presenting a triad of broad instructional philosophies. Following that, the COVE model of agent-based learning is outlined, and several alternative agent modeling approaches are briefly described and compared with implications for contributing to the field of simulations for improving teaching. The second half of the chapter provides a broad outline for situating the agent model of a learner in a context that includes the nature of knowledge and the role of the social community in shaping learning. It is important to point out that the HPL framework (Figure 1) is not a model of transmission of knowledge to students. Rather, it is a whole-systems perspective on how people learn, a subset of which takes place in traditional classrooms. We should not expect HPL theory to inform the computational modeling of teaching, but it has much to offer models of the act and context of learning. The whole-systems view of the HPL framework suggests that a simulation to improve teaching should be personalized and adapted for maximum effectiveness with many different kinds of prospective teachers. It needs to reflect how experienced teachers work with their own and students’ existing knowledge and how students develop new knowledge through modeling and experimentation. The simulation needs to be contextualized within real situations and embedded in real communities of peers and experts who communicate and shape one’s thinking. Finally, the simulation needs to be laced with ample, timely, accurate, expert feedback to guide one’s development of knowledge-in-action.